For our last Saloon in the old year, we visited das weisse haus to talk about their multifaceted ventures as an international studio and residency program, as exhibition space, and as an important Viennese art association. 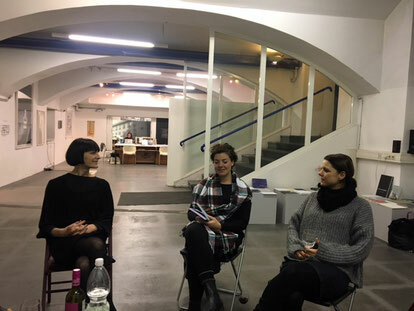 Alexandra Grausam, founding director and curator, and Katja Stecher, project manager of studio das weisse haus, gave us valuable insights into the running of independent project spaces in Vienna. It was an uplifting talk on how to keep going with non-profit initiatives in precarious times and the importance of friendship and stamina. We all left empowered for our future endeavors.